Why do you, as an Employer, need to invest in Learnership Programmes? Learnership programmes have become an integral part of skills development. Our unique economic situation brought to light alternative ways of bridging the skills development gap. One of these ways is embarking on a Learnership programme. Learnerships are based on combining theoretical knowledge with on-the-job training. It is, in short, an education tool that will reap the rewards – for employers who implement these programmess and employees who commit to them. “Education is the passport for the future, for tomorrow belongs to those who prepare for it today.” Malcolm X. The sentiment about education being a powerful tool and a passport for the future is echoed by Benjamin Franklin who said; “An investment in knowledge pays the best interest.” There is no doubt that learnerships and training will positively impact the success of your business. Improved work performance as a result of newly acquired skills and knowledge. Learnerships result in independent employees who don’t need much supervision. Can be used as a multi-skilling tool to develop capabilities of employees in different aspects of the job/occupation. Learnerships are developed by industries, so it is industry-specific and therefore relevant to a specific occupation. In other words, employees will be introduced to relevant training material that can be applied in the work environment. Learnerships are developed as industry-specific programmes, they adhere to industry standards and are therefore up-to-date with industry modus operandi. Customisation of Learnership programmes to meet specific workplace needs. 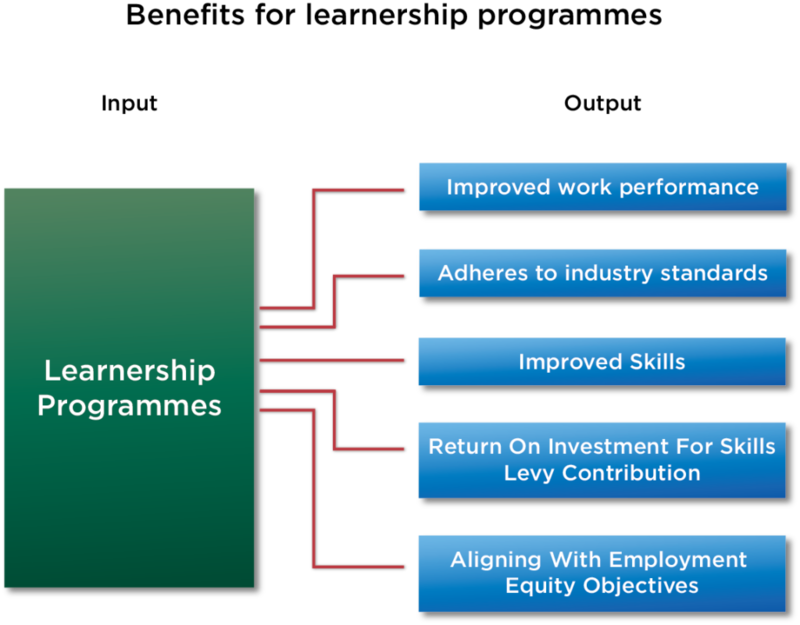 Skills Levy contribution returns as as result of investment in Learnership programmes. Results in increased motivation so employees who add value to your business. Increased efficiency as a result of improved skills. Align with employment equity objectives by training learners and improving your B-BBEEE scorecard as a result. Employment seekers who are on a contract with an employer will form part of a relevant skills pool. The employer does not need to look for people outside the skills pool to employ, but can rather look into an existing skills pool. Build loyal employees as they will be less likely leave a company that invests in their well-being; professional and personal. The benefit of planting today what you wish to reap in the future cannot be emphasised enough. Learnerships will take your company to the next level. Here is an apt quote by Leo Buscaglia; “change is the result of all true learning.” Call us today; one of our Learnership Training specialists will be able to assist you with the best training solution for your business. What is the True Value of a Learnership Programme?